I am Thankful for Pumpkin Pie! 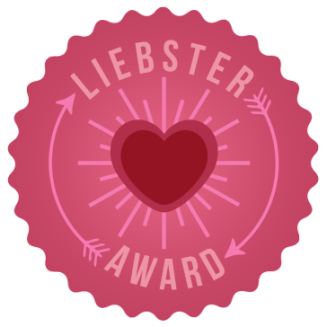 I know, I am late…. Thanksgiving day is usually a very quite and reflective time for me. The boys hunt and I cook and everyone gets together for dinner around 5:30 and we spend the rest of the evening watching the little ones play and talk shop. So I usually have the day to myself, and Tom the turkey, but some how this year it just did not happen. One reason was the new bread maker that I received as a birthday present earlier this month. I will be posting what I made yesterday once I have mastered ” dinner rolls” they tasted great but looked a little funny. So, like most people I just ran out of time to share that I am thankful for Pumpkin Pie. Yes, I know it sounds a little childish but pumpkin pie is really what I was thankful for this year and I will tell you why. It all started with a my husband Tom… He really is my hero in life and on my Barnwood Builder episode. He helped me till a small garden at the other house that we were living in last summer. In that garden Tom and Christopher help me plant 3 pumpkin seeds. From those seeds grew 13 pumpkins, I think, if I can remember correctly. Then after a long summer I was so thankful that Cody my older son and my granddaughter Paige and daughter-in-law Jamie were able to come help us harvest everything in the garden including the pumpkins. It took hours to bring in everything that grow well that year. We had sweet potatoes to dig, pumpkins to pull and tomatoes and peppers every where. 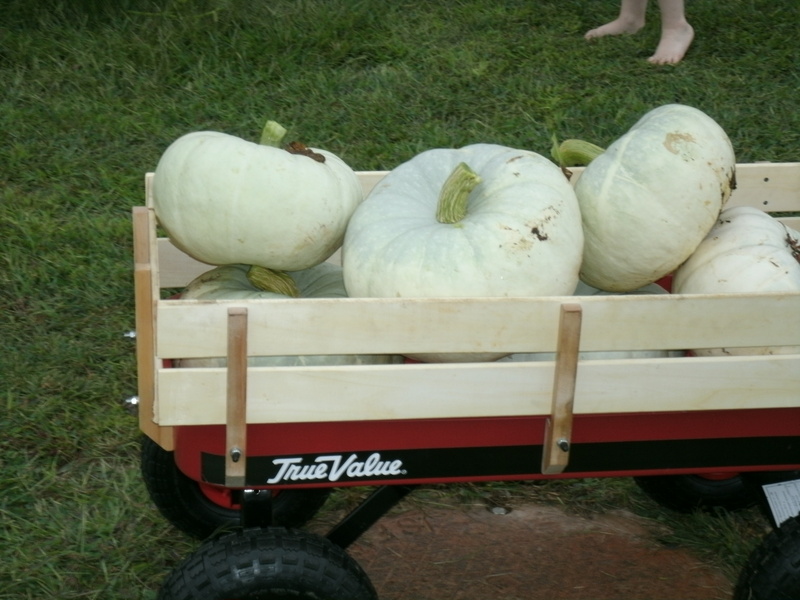 The baskets were full,the wagon was full and I had a lot of work getting these pumpkins ready to eat. I aged the pumpkins in the cool of our porch until Halloween came. I had my foot surgery just days before Halloween and I was off my feet when the holiday rolled in. Again Tom help me out with the most important Halloween tradition of carving at least one of our pumpkins. Christopher and Tom spent one evening craving a couple of pumpkins and decorating the porch with them. I was so Thankful to see them and see the smiling face on my little Christopher’s face when he lighted them up. From the rest of the pumpkins I made pie filling. So in the weeks leading up to Thanksgiving I cooked and canned most of those pumpkins. The house smelled wonderful for days as I roasted on the first day and pureed the next. Finally I cooked and added spices to the mixture and put it in the jars with love. Thankful that Christopher had a school to go to and Tom had a job to work at, as the huge mess in my kitchen grew. 2 days and 6 hours later the jars sealed and I have jars of home-made pumpkin pie filling. Then after moving our family over the long cold winter,we stared working on the house. I am so thankful for our new home. This was my first Thanksgiving in my new to me kitchen and the first time I drug out the good dishes and glasses in years. It was a wonderful reason to take out a jar of that pumpkin pie filling and make a pie to celebrate. Finally, I am thankful for every person who sat at my table, for every opportunity I have to spend time with them. I am thankful for those who are missing this year and the ones that are in heaven. I am thankful for the money to buy the meal we ate and most of all I am thankful for pumpkins and pies. 4 generations of the Powers family together for Tom birthday 2014. Apple Cider Vinegar Made from Scraps of Home Made Apple Sauce. Apple sauce, apple butter, apple jelly and apple cider vinegar are things I try to make for my family every fall. I try very hard to forage my apples to use in these recipes. I hate to see one of my friends let a tree full of healthy organic apples go to waste. So every summer I start looking around at who has apples that they do not use and try to remember to ask them if I can have them. This summer I was a little unsure of where I was going to get my apples. We moved and I did know to many people who had apple trees in our new area. I remembered a huge apple tree at my favorite public library. Why not ask the librarian of the Lewis Bennett Library what they were going to do with some of the apples…. it couldn’t hurt to ask right? So after asking the head Librarian Karen about the apples, she said no one had asked for the apples and most of the time the apples just fell and made a huge mess on the library side-walk. She let me have as many of the apples as I wanted. The tree is well over 100 years old and they do nothing to maintain the tree so they are again chemical free, of unknown species and cost me nothing, a perfect fit for my foraging personality. 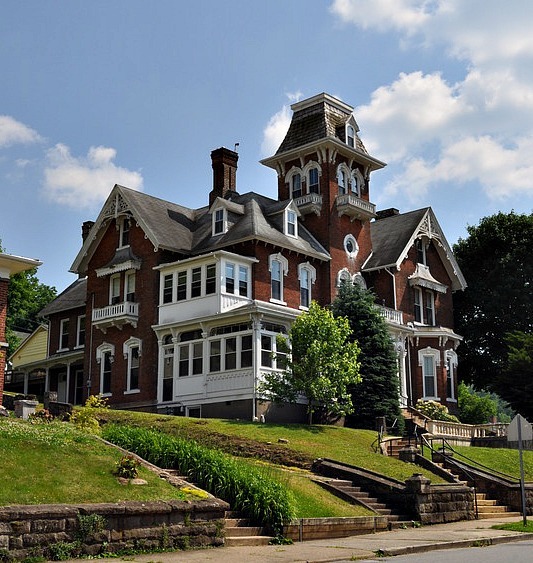 So after a couple of hours with my apple picker in the yard of this historical mansion I had filled my buckets with about 70 pounds of a soft yellow-green apples. Most people call these deer apples and never plan to use them at home but let the deer enjoy them.Today I was able to make 6 quarts of apple sauce from 8 pounds of these little apples. 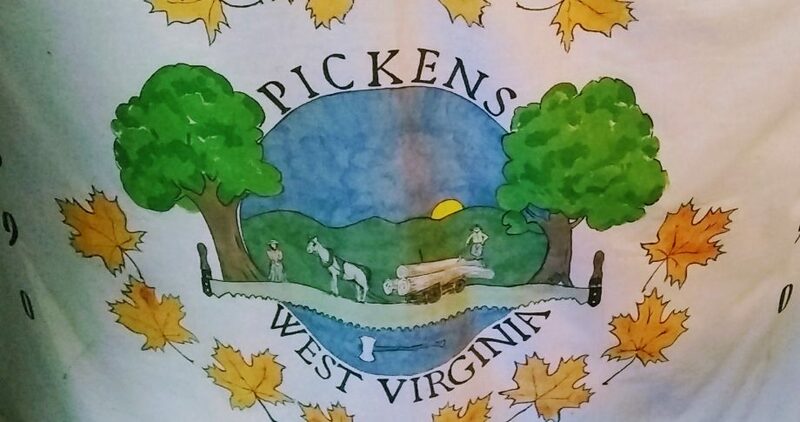 ( I have a DIY post about how to make Home Made Apple Sauce here) They made a very nice sweet apple sauce so I am guessing they are a golden delicious type of apple developed in Clay County West Virginia around the time the house was built. 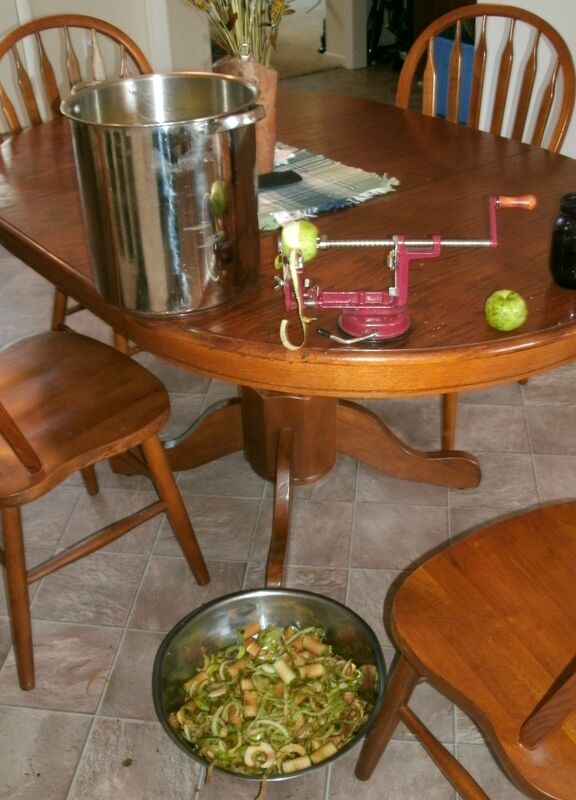 To make Apple Cider Vinegar I took the peals and cores from these apples and split them between two gallon containers. I left enough room at the top to let water stand over the top of the cores and peals. 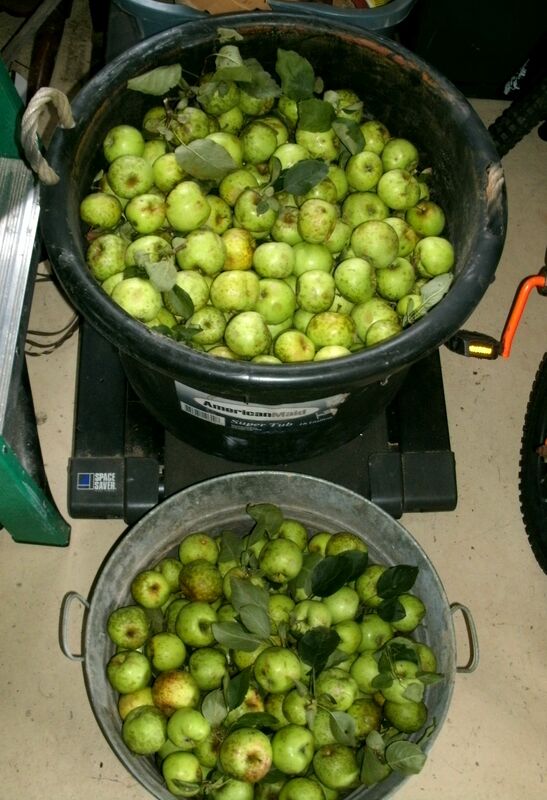 The apples will begin to ferment under the water’s surface but Some mold may grow if a peal is sticking up to high. 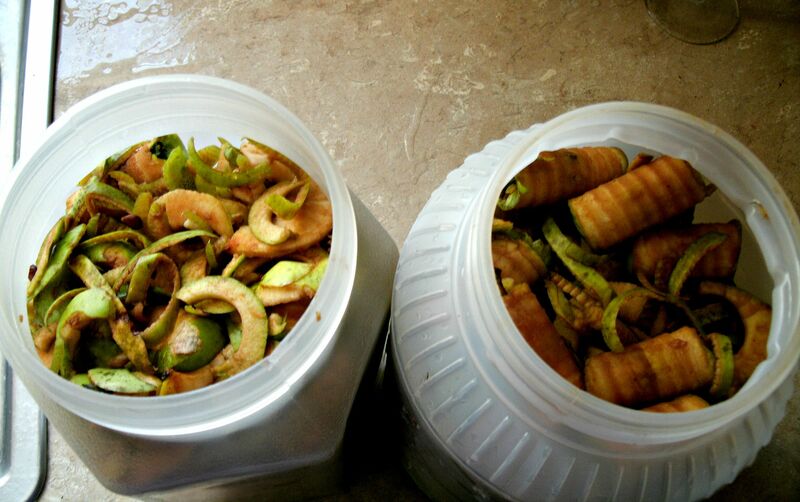 Apple peals and cores in plastic gallon jars. 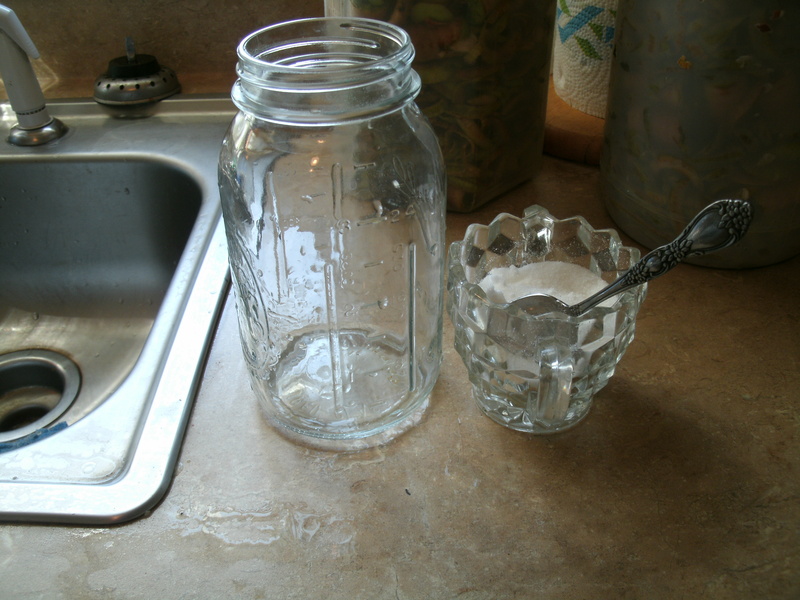 Next I added 2 and 1/2 quarts of warm water that I had added 2 1/2 heaping tables spoons of white sugar to each jar. Making a 1 to 1 ratio of sugar to water. The sugar helps feed the Bactria to get a good start to the fermentation. It also adds a sweetness to the vinegar. I use most of my vinegar for cooking so I want a strong apple flavor without much sweetness. If I was drinking this everyday I would add more sugar to make to flavor more drinkable. One recipe I read had 1/2 cup of sugar per gallon. It is not necessary to use this much sugar, apples ferment quickly! Apples have a lot of natural sugars and yeasts that ferment so well it is hard to stop raw apple juice from turning to wine and vinegar in a matter of days with out a chemical to stop the fermentation. Believe me no sugar is really needed to ferment apples, we have had a few drunk cows on the farm from eating rotten apples in the pasture,what a funny sight ! Here I am trying to keep the apples under the water surface with a small bowel to prevent mold or scum from growing around the top of the jar. I then cover the jars with cloth to prevent bugs or dust from getting into the jars. I store my jars in our laundry room. Where the temp in the summer is more constant much like a cellar. It never freezes but is never as hot as the house on a hot summer day. 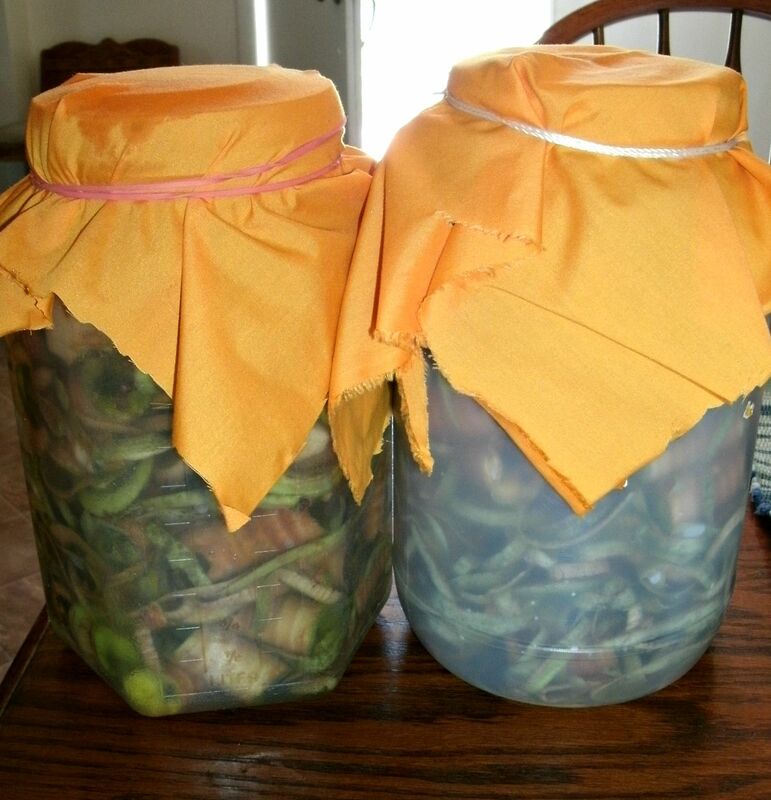 The best fermentation happens between 60 and 80 degrees F.
Now I wait two weeks to strain out the apple cores and peels. The fermentation will actually take several weeks and the smell of vinegar will increase as the amount of sugar decreases. At about 4 weeks the sugar should be eaten up by the bacteria that converts the sugar to alcohol than into vinegar. At this time you can filter the vinegar to make it look clear or rack it just like wine. I will filter mine with cheese cloth just to remove the large pieces of apple and return the vinegar back to the shelf for two more weeks to make sure that all the fermentation is finished at 6 weeks. 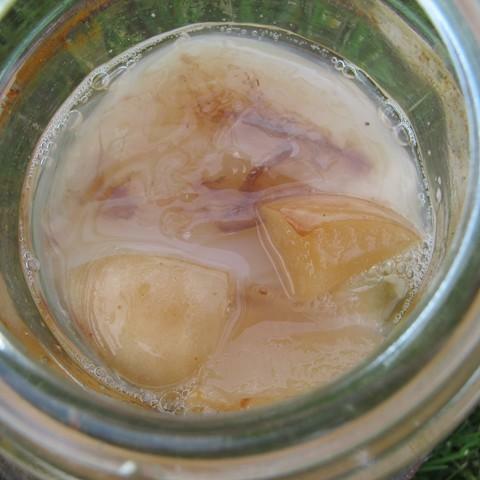 If by chance you notice that the apple cider vinegar has a slimy pad floating in it (smile really big)… you have grown a “Mother” or “Scoby” that should be removed and stored to make the next batch of ACV ( apple cider vinegar) and reduce the time for fermentation to about 4 weeks on another batch. 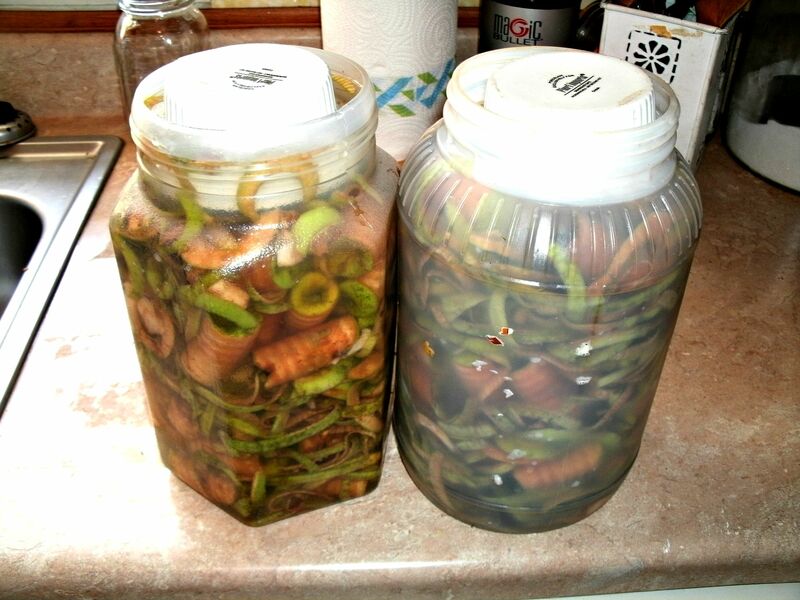 The raw ACV can at this point be bottled and kept in the refrigerator and it will be good up to 1 year. My family goes through about 1 gallon in a year so this is the amount I try to make. 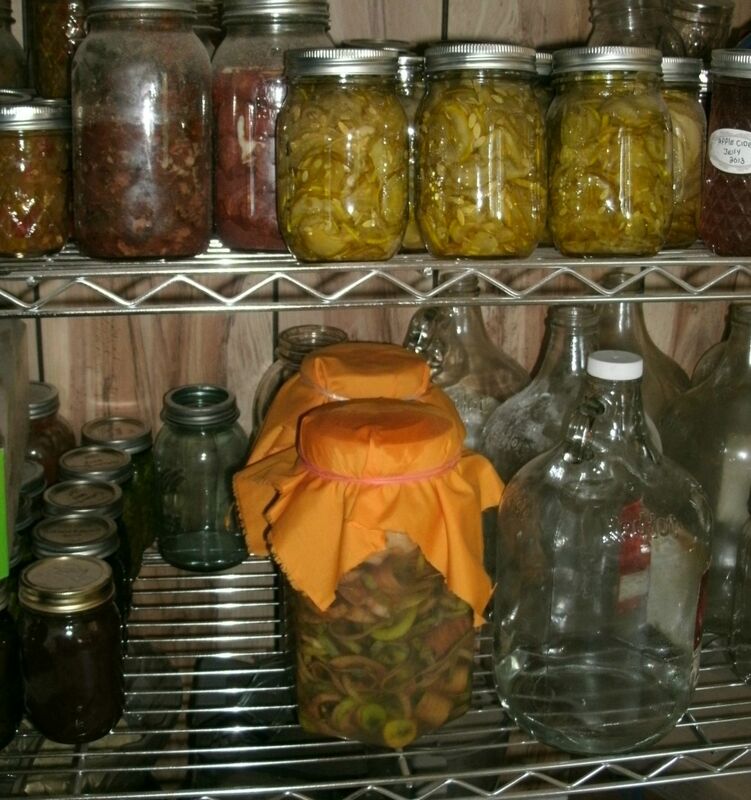 If you want to keep it on the shelf for easy storage then the you need to cook and bottle the ACV. The cooking process does two things. It will kill the good Bactria growing in the ACV ( pasteurizing the ACV) but will also stabilizes it so that you can store it almost indefinitely. ACV is processed like any other canned food with sterile bottles or jars and correct processing times. So if you are a fan of raw apple cider vinegar you can make this for pennies. I think the most expensive part would be to get containers. 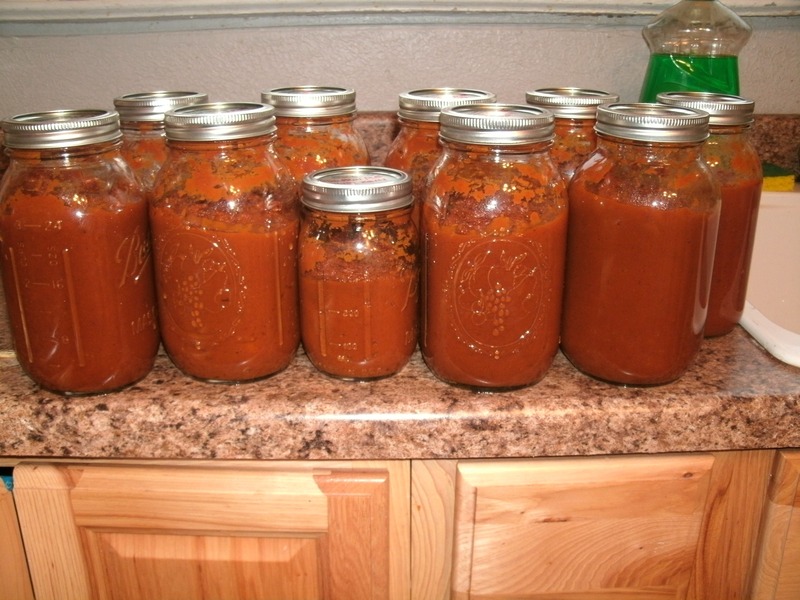 Most families do not use as much vinegar as we do so with just an old spaghetti sauce jar ( 1 quart size) and 3 apples you could make enough ACV for at least 6 months. It is just another way to make some thing from free healthy foraged food. 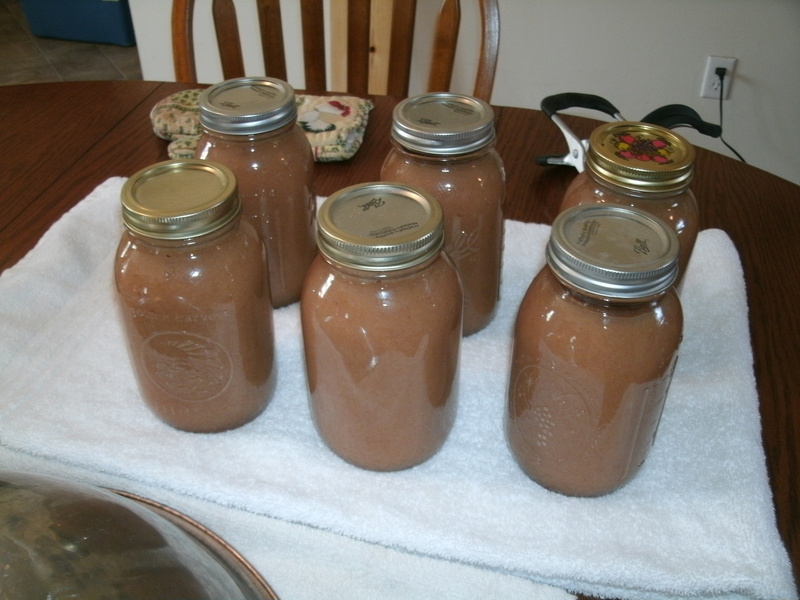 So when I finally get the 18 quarts of apple sauce finished, the 8 pints of apple butter, the 10 jelly pints of apple jelly, and the gallon of apple cider vinegar finished in 6 weeks, I will feel like I stocked my pantry well from these free ugly old deer apples that no one wanted! Here at links to my post on Slow Cooker Apple Butter and Apple Jelly they are also made with free apples and made much like this with a two for one process. 5 Reasons to Plant Silver Moon White Pumpkins in the Garden Next Year. This year is the first time I have had any success growing pumpkins and just for the fun of it we chose to plant white ones just to add some fun to our Halloween display. It was a bumper crop and here are my five top reasons I will plant these pumpkins again next year. They met and surpassed all of my exceptions for home-grown pumpkins. First they were very prolific. 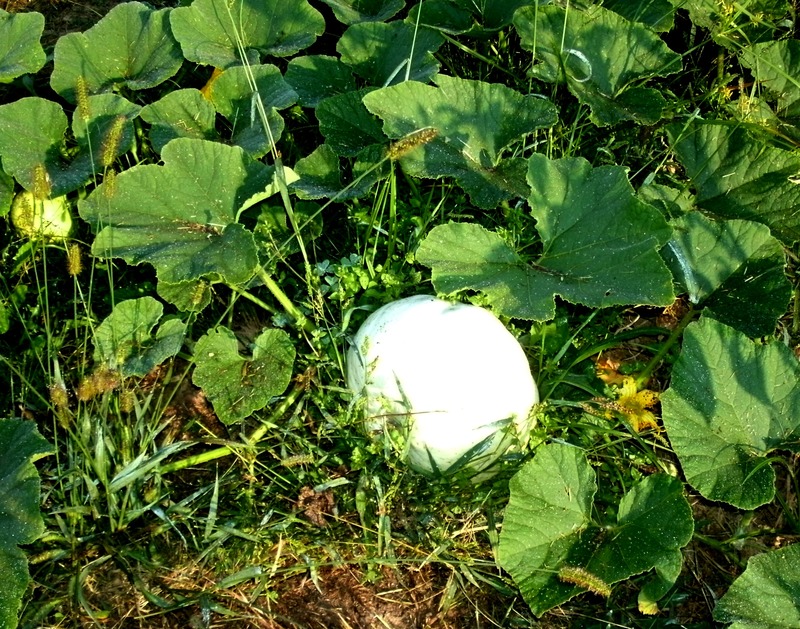 I planted only one hill of the Silver Moon Hybrid pumpkins, with only three seeds. 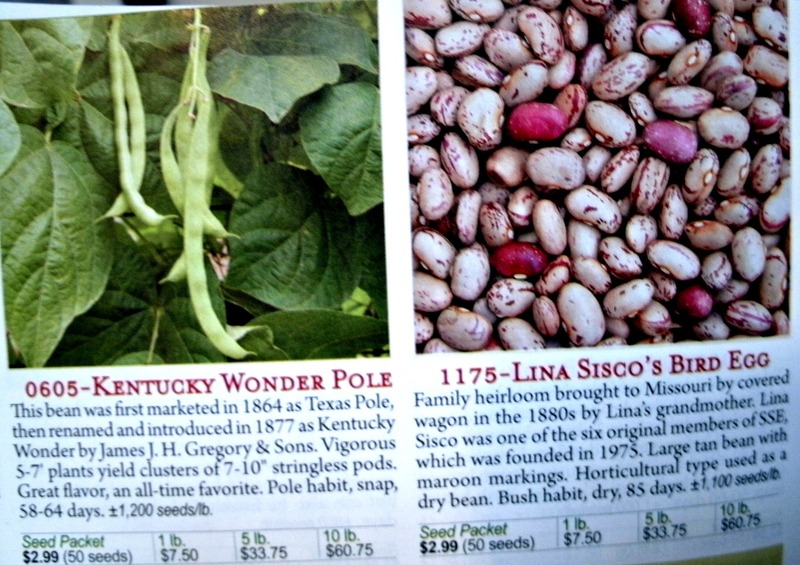 I purchased the seeds from a Henry Field’s catalog 4 years ago. Sadly these seeds had been in storage for all those years. From those(to old to use) seeds I ended up with two healthy plants and ended up with 12 pumpkins.We were shocked and over joyed that most of the pumpkins were actually carving size ( 5 to 10 pounds) and I ended up with only two that were so small I could not even make them into pie filling. 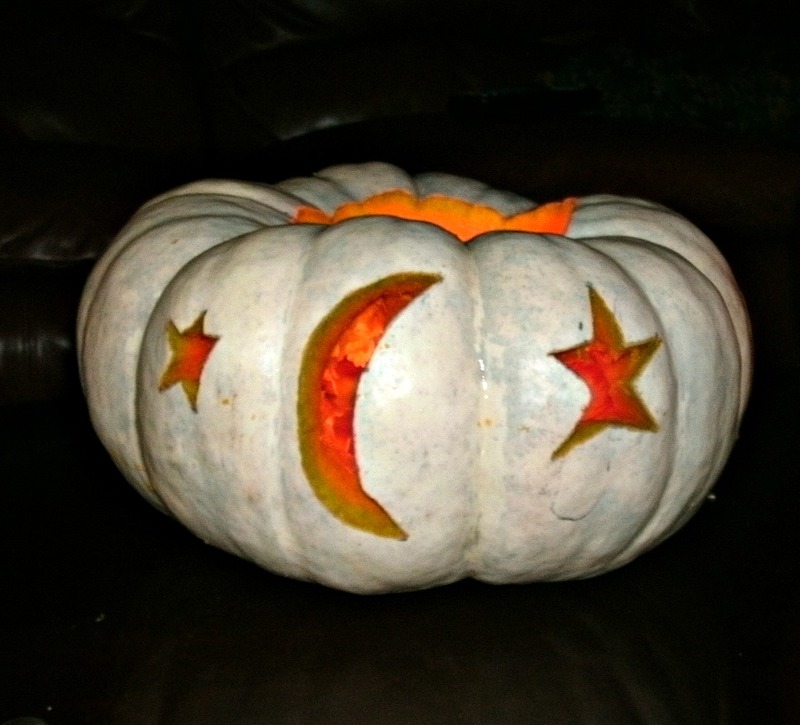 The second and main reason I planted the pumpkins was how beautiful they are when carved. They range in color from snow-white to a pale green with white stripes. So for carving we chose to use the brightest white ones. As you can see from the above photo the pumpkins are white on the outside but have bright orange pulp with a wonderful green rind and when lit they are just so wonderful to look at indoors and out. 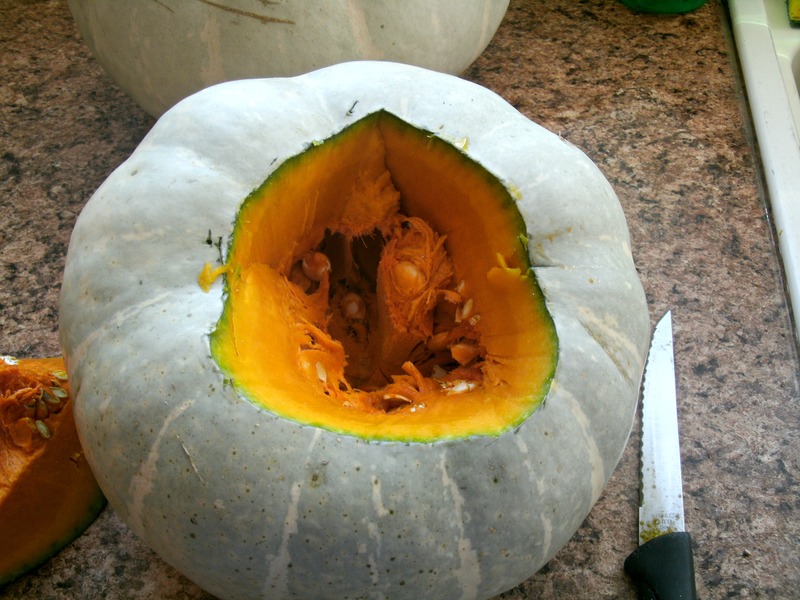 The next best reason to plant these pumpkins is, no matter their size, have very thick pulp. Making these very easy to turn into puree’ and pie filling. I only got to process 4 pumpkins before my foot that is still recovering from surgery said that I was standing to long. So With just 4 pumpkins I was able to get 10 quarts of pie filling that I will be using next week for Thanksgiving dinner. The fourth reason I like these pumpkins over the average orange ones is for storage value. They are a short squat pumpkin much more akin to a squash shape. So when storming them I could actually stack the pumpkins on top of each other on a shelf. That is never going to happen with a large round orange pumpkin.They also have less of an air space inside making them less prone to rot. Then finally they have seeds, not for planting (being hybrids) but for eating. 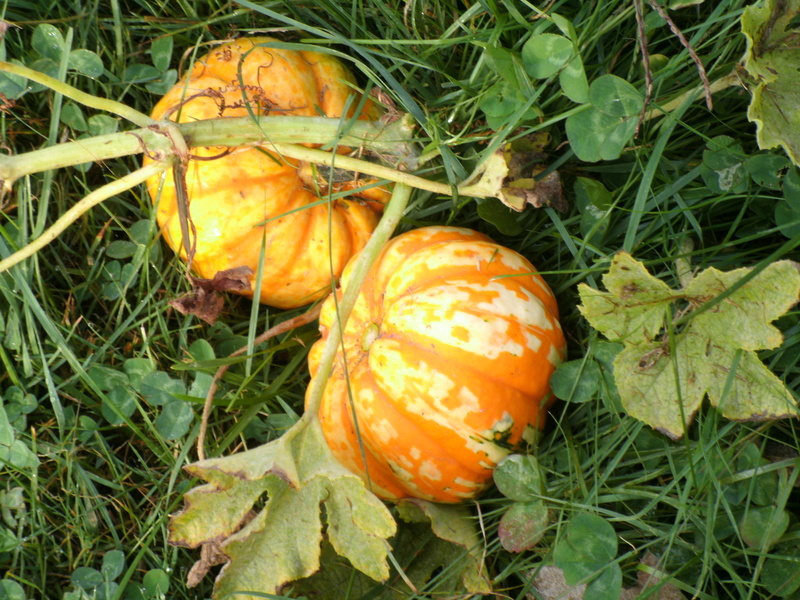 These pumpkins have a wonderful snow-white seed that are large for a 5 -6 pound pumpkin. They are thickly packed into the small cavity in the thick pulp. I was so surprised that we roasted several batches with salt and cinnamon sugar for a nice snack. It has been so much fun trying out new seeds in the garden and letting my sons enjoy every part of the activity. I can’t wait to serve a home-grown chemical free pumpkin pie to my family and friends this year at Thanks Giving. 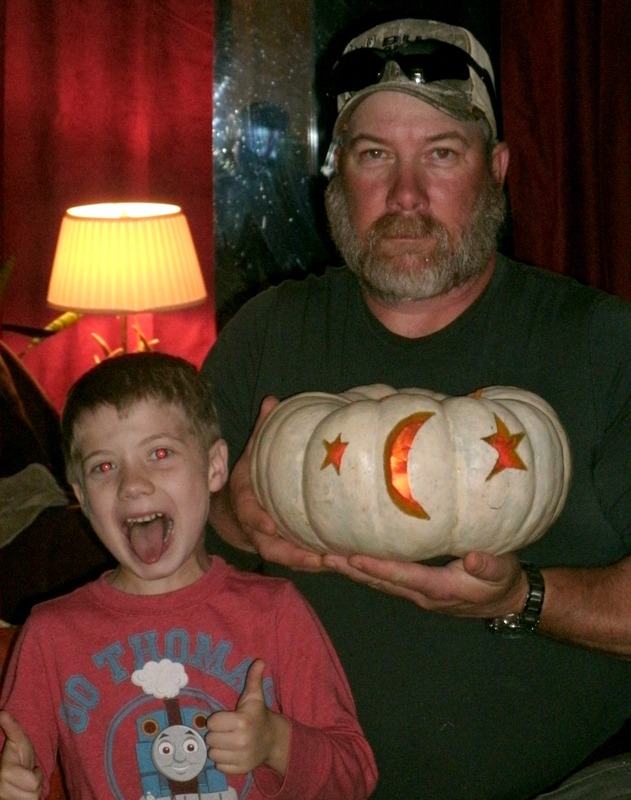 This is one seed that I will plant again and again, just to see the joy on Christopher’s face when Tom helps him carve his very own pumpkin. Surprise! That is not a cantaloupe. Have any of you with gardens planted what you thought was one seed and ended up with some thing different. This happens at my house every few years when I by plants already started . I have even bought two trees that had incorrect labels. Both times I was trying to buy Bartlett Pear trees and ended up with ornamental Pears that had no fruit. So why should it surprise me that I ordered cantaloupe seeds from a reputable see catalog and got a surprise. 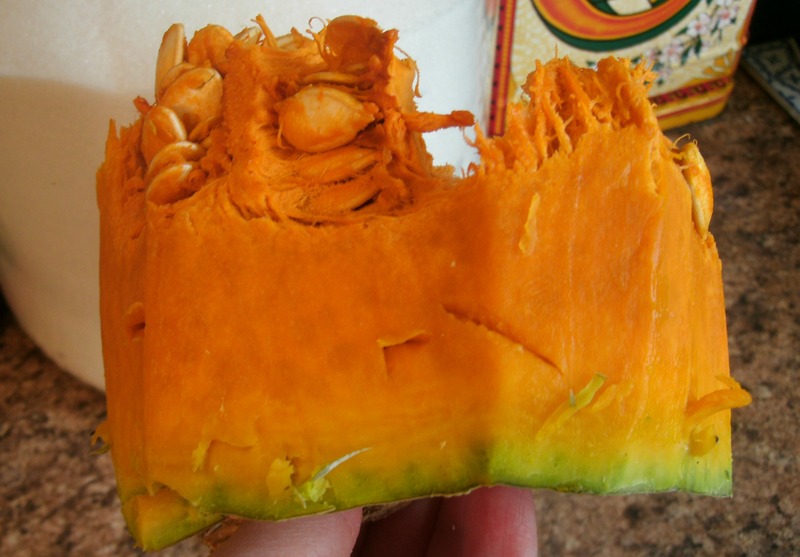 My husband was the one to notice that the skin of our cantaloupe was not the heavily netted skin that you would expect. That was when we though we had something different and that was about two weeks ago. 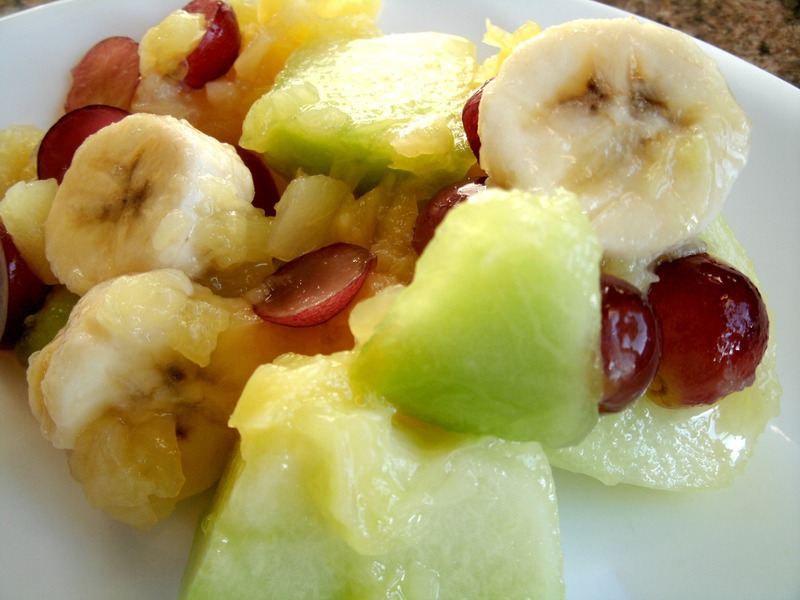 Now as you can see we have a wonderful green Honey Dew to enjoy with dinner tonight. I have often wondered how people who collect, store and sell seeds keep all of them organised. So this kind of mix up does not happen. I have even experienced wild cross-pollination of pepper plants. Turning my sweet bells into a hot bell mix. 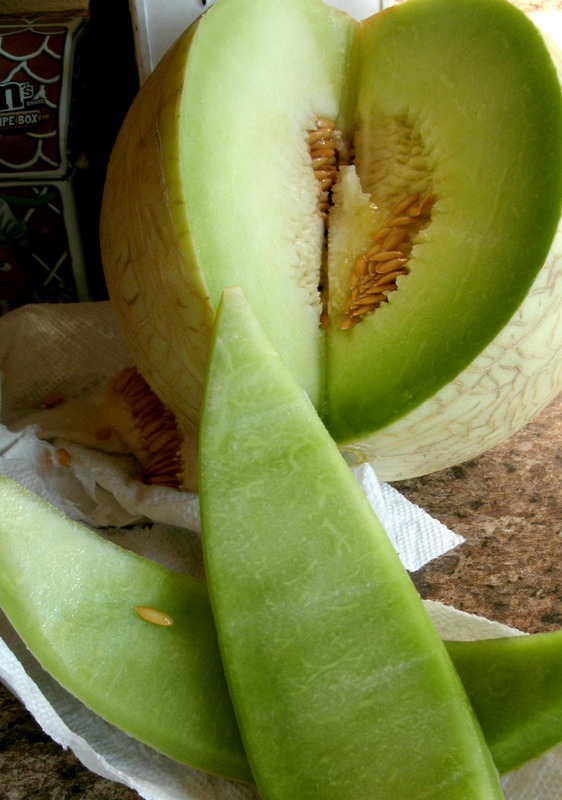 Not that we were complaining because we always raise both and eat lots of peppers but this melon mix up was an out right mistake of identity. So as summer comes to a close and my garden is still full to the rim with fruits and vegetables of all shapes and sizes I just wonder if my water melons will be yellow instead of red and if my sweet potatoes with be blue instead of orange… It might just happen because my pumpkins are white and my Cantaloupe is now a Honey Dew.